A while ago our study ‘Ownership in the Hybrid City’ was published. The study, written in collaboration with Virtueel Platform, informs the upcoming event Social Cities of Tomorrow (14 − 17 Feb 2012). At this moment the study is being translated into English (more soon). In the study we explore how digital media can strengthen ‘ownership’, that is, citizen engagement with collective urban issues and the capacity to act on them. The notion of ownership then is about inclusiveness, access and agency rather than exclusive proprietorship. Collective urban issues can have a global scope, like sustainability and social equity, or be locally specific, like shrinking cities and empty spaces. They are commons questions that involve multiple stakeholders with sometimes conflicting interests. The question therefore is: how can digital media be used to promote durable changes in citizen involvement, beyond being mere technological fixes? The research started by compiling a longlist of cases. The list includes both international and Dutch examples. From the list several themes emerged. The themes share an underlying formative principle for stimulating or organizing ownership. In a series of two posts these are presented with examples. Note that many websites are in Dutch only. Governments and other institutions are opening up data they have collected and generated with the aim to stimulate creative reuse. Open data itself can be seen as a resource, a ‘data commons’. This entails a conceptual shift in the notion of ownership from possession to the right to act. In addition to a mentality change among organizatons, the challenge is how these data can be opened up to useful ends. The conceptual difference between data, information, and knowledge is important here. What data is potentially valuable information? How can that information lead to new knowledge and stimulate the capacity to act among urbanites? Countless open data platforms and projects exist. The Netherlands seems to lag compared to other countries, particularly the US and UK. Interestingly, cities are spearheading innovative approaches to open data efforts more than national governments. - United States Government open data – data.gov. USA open gov data sets, aiming to create a more participatory democracy and empower people. - UK government open data – data.gov.uk. UK’s open gov data sets. - European public data – publicdata.eu. Especially from the UK. A project by the Open Knowledge Foundation http://okfn.org. A work in progress overview of open government data is maintained here: http://lod2.okfn.org/eu-data-catalogues/. This foundation is also involved in the List of European Open Data Catalogues http://lod2.eu. - European Public Sector Information (PSI) Platform – epsiplatform.eu. European initiative to allow creative reuse of government data and to strengthen community, and stimulate action. - France gov open data data.gouv.fr (in development). - Paris open Data – http://opendata.paris.fr/opendata/jsp/site/Portal.jsp. - New York City open data – http://www.nyc.gov/html/datamine/html/home/home.shtml. - Datamarket.com – Data portal to visualize statistics of public and semi-public organizations, like the UN, World Bank, Eurostat, Gapminder. These are specifically Dutch examples to open up government data. Note how each project has a different focus. - Open data portal Dutch national government – http://data.overheid.nl. Can also be found via http://nl.ckan.net. An initiative by the Ministry of Internal Affairs. - Apps for Amsterdam – http://www.appsforamsterdam.nl. Apps for Amsterdam is an initiative to make as much data from the Amsterdam municipality accessible for everyone. We do this by calling upon developers and students to translate these statistic information or Open Data into successful applications for smartphones, web or Facebook. Apps for Amsterdam is a collaboration between Waag Society, Amsterdam municipality – economic affairs, and Hack the Overheid. - Apps for Eindhoven – http://www.openeindhoven.nl. Open Data Eindhoven is a platform for data producers, data processors and data users. The contest Apps for Eindhoven connects to an international development of governments, programmers, designers, businesses and researchers who consider Open Data as an important impulse and fundamental factor in the quality of the information society. The development of Open Data in Eindhoven is supported by the platform Open Data Eindhoven, which exists of private persons (e.g. programmers, creatives), (representatives of) cultural and social organizations, companies, Eindhoven municipality, RHCE, Noord-Brabant province, TU/e, Fontys. - Realtime air quality measurements by the Amsterdam GGD – http://www.luchtmetingen.amsterdam.nl. Visualizing normally invisible urban processes can be a way to make complex urban life intelligible to people and create public issues and collectives. Projects about the urban living environment for instance use data visualizations to involve people and possibly even stimulate behavioral changes. Some ‘citizen science’ projects crowdsource the gathering of data to people themselves. In some cases the question is whether crowdsourcing is limited to a signalling role for citizens without allowing the agency to act on issues. Another question is where lies the boundary between engaging citizens and throwing institutional responsibilities over the wall? - Trash|Track (MIT’s Senseable City Lab) – http://senseable.mit.edu/trashtrack. How can pervasive technologies expose the challenges of waste management and sustainability. Can these same pervasive technologies make 100% recycling a reality? - The Daily Pothole – http://thedailypothole.tumblr.com. NYC government offers citizens the opportunity to signal potholes in the road and tell about it. - Street Bump -http://www.newurbanmechanics.org/bump/. The same idea exists in Boston, now by using a smartphone to ‘see click fix’ potholes. - Green Watch – http://www.lamontreverte.org/en/. 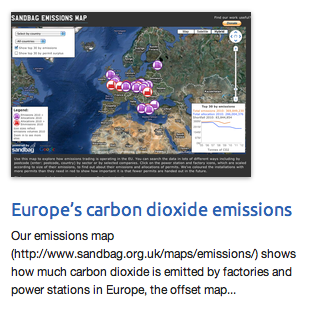 Project by Daniel Kaplan, involving Parisians in environmental measurements and mapping. - In the Air, Medalab Prado – http://www.intheair.es. This is a somewhat similar project to Green Watch, in which air quality is measured and visualized. - Hollaback – http://www.ihollaback.org. Hollaback! is a movement dedicated to ending street harassment using mobile technology. The project tries to enhance urban livability. - Ushahidi – http://www.ushahidi.com. A platform for collecting, visualizing, and interactive mapping of various data worldwide. - FixMyStreet – http://www.fixmystreet.com. Small issues in one’s immediate environment can be reported to responsible institutions in the UK. - Open Ideo – http://openideo.com. A crowdsource platform by design office Ideo with regular contetsts and prizes. - Stimulus Projects Spot Check – http://projects.propublica.org/spotcheck. Project by journalists to monitor the status of US gov financed transport projects. - Verbeterdebuurt – verbeterdebuurt.nl. The Dutch version of FixMyStreet, which also has an augmented reality app for the mobile phone. - Geluidsnet – www.geluidsnet.nl. People living in the vicinity of Schiphol Amsterdam airport do their own noise measurements using cheap technologies as a way to counter official measurements that they do not trust. - Waag Society SensorLab – http://creativelearninglab.org/nl/evenementen/sensorlab-op-picnic-young-2010. A workshop organized by Waag Society’s Creative Learning Lab and GLOBE Netherlands at PICNIC 2010 about the possibilities of sensor technologies in education. - DEvLab – http://www.devlab.nl/?projecten. Research about wireless sensor networks and platforms (examples of projects: MyriaNed, Atalanta). - Urbanode project – http://www.vurb.eu/2010/04/09/the-urbanode-project/. The mobile phone has become a remote control for the city. VURB and partners will enable a set of environmental services in the Trouw building to be ‘discoverable’ by mobile devices, and controlled by citizens/users through applications on their smartphones. One of the most interesting aspects to investigate about these types of contexts will be the social dynamics of resource sharing. - Sense/Stage - www.nescivi.nl and http://sensestage.hexagram.ca/workshop/. Marije Baalman is a Dutch artist and developer who works with interaction and sound, using code and electronics. She has been part of Sense/Stage research project with Chris Salter at Concordia and McGill University in Montréal from 2007-2010 and is currently developing a Sense/Stage sensor network kit for distribution. - Transitiekaart – http://www.richardvijgen.nl/. This project visualizes spaces in the city that are in transition on a big interactive screen. The project aims to study the possibilities for temporary uses of spaces. - Overlastdagboek.nl – http://www.meldwoonoverlast.nl/pages/overlastdagboek. People can report nuisances in their living environment. An increasing number of projects are founded on principles and modes of organization found in e-culture, like knowledge sharing, participation, co-creation, peer-to-peer networking. In such projects (part of) the actual design and the execution of a transformation lies with citizens themselves. This is a step further on the ladder of participation than crowdsourcing existing issues where people only have a signalling role and/or a role as generators of ideas but their right or capacity to act remains limited. What is a workable balance between a top-down and a bottom-up approach? Or is peer-to-peer organization a kind of third way? Further, who are reached by these projects? Are these the people who are already technologically savvy and know how to work with digital media technologies? Or are new publics reached too? NIMBY-ism is a concern as well. To what extent do these projects support or reinforce a “not in my backyard” attitude of a closed in-group of people? A substantial number of projects rely on game principles to persuade people to participate. Discussions about the ‘gamification’ of urban life then come into play as well. - Natalie Jeremijenko’s environmental health clinic – http://www.environmentalhealthclinic.net. New Yorkers who have particular environmental health concerns can make an appointment and walk out with a prescription for actions, like local data collection and urban interventions directed at understanding and improving environmental health, plus referrals to specific art, design and participatory projects, local environmental organizations and local government or civil society groups. - Betaville – http://bxmc.poly.edu/betaville. Betaville is an open-source multiplayer environment for real cities, in which ideas for new works of public art, architecture, urban design, and development can be shared, discussed, tweaked, and brought to maturity in context, and with the kind of broad participation people take for granted in open source software development. Pilots in lower Manhattan en downtown Brooklyn. - IBM CityOne game – http://www-01.ibm.com/software/solutions/soa/innov8/cityone/. Like other tech companies – Cisco, Philips, Fraunhofer, HP – IBM focuses more and more on using technologies for the design of so-called ‘smart cities’. This is a serious game used for urban design. - DIY City – http://diycity.org. DIY City is a website where people from all over the world think about, talk about, and ultimately build tools for making their cities work better with web technologies, a kind of ‘wiki-city’. Mostly US based. - Commons The Game – http://www.commonsthegame.com. In Commons, compete to do good, while problems in your city get fixed. Report a problem or recommend an improvement in your neighborhood that you think deserves attention and resources. Vote on the best reports and improvements, and see what’s most popular in the hood. Go on short missions around town to earn bonus points, and unlock City awards to level up through the game. 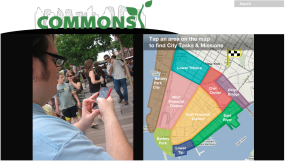 With Commons, share the things that you care most about fixing and improving in your neighborhood, and discover new ways to explore your city. - Open Street Map – http://www.openstreetmap.org. Collaborative open source mapping project. - Tools for actions – http://cca-actions.org. Exposition in the Canadian Centre for Architecture, Montréal with 99 actions that instigate positive change in contemporary cities around the world. - Howtopedia – http://en.howtopedia.org/wiki/Main_Page. A collaborative platform for practical knowledge and simple technologies that are easily explainable and usable by individuals or small communities for a sustainable and ecological future. - Open Farm Tech – http://openfarmtech.org/wiki/Main_Page. Wiki for sharing knowledge about open source and low priced DIY farming technologies. - Hub2 – http://nms.sagepub.com/content/13/1/75.abstract?rss=1. Academic article by Eric Gordon and Edith Manosevitch describing how they used a simulation environment – Second Life – in the design process of a public park in Boston. The application of participatory game principles for ‘real life’ social ends is called ‘augmented deliberation’. - Face Your World – http://www.faceyourworld.nl and http://classic.skor.nl/artefact-1114-en.html. A project by artist Jeanne van Heeswijk and architect Dennis Kaspori (2005) that took place in among others Amsterdam and Rotterdam. 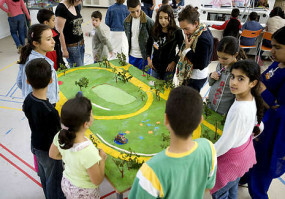 By participating in an artwork that combines urban development, computer technology and creative thinking, young people and neighborhood dwellers adopt the role of urban designers and make a plan for the new Staalmanpark in Amsterdam. The interactor, as the simulation software used is called, allows them to manipulate, recombine and reuse their environment in order to shape an innovative vision on their city. With this collaborative plan the Van Heeswijk and Kaspori managed to persuade the local government to abandon the initial plans for the park and execute the new one instead. - Baas op Zuid – http://baasopzuid.nl. 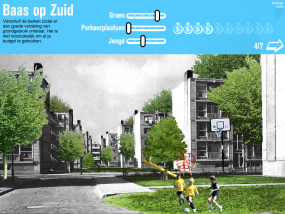 The online game ‘Boss on South’ allows inhabitants of old Rotterdam neighborhoods Pendrecht and Zuidwijk to take (virtual) policy decisions and help think about the regeneration of the area. A project by BBVH Architects. - Wireless Leiden – http://www.wirelessleiden.nl. A good example of a bottom-up knowledge sharing project is Wireless Leiden, in which citizens of Leiden build and maintain a citizen wireless network, and offer a range of services to local parties and organizations. - Scan je Buurt – http://www.bendeburgers.nl/?p=153. The project ‘Scan your neighborhood’ aims to let young people, policy makers, and politicians to create common policies by using an interactive map with geo-tagged multimedia from the neighborhood. - De Amstel Verandert – http://www.deamstelverandert.nl. (‘The Amstel is changing’) How does the future look of the Amstel (the river Amsterdam was built next to)? As broad as possible a group of people from Amsterdam and surroundings share their ideas on a website and during four meetings. - Stadsdialoog Delft – http://stadsdialoogdelft.nl/. In ‘City Dialogue Delft’ inhabitants of Delft informed and inspired urban planners in three conversations and via an online platform. - Indemann – http://studio.driezesnul.nl/maurer/2009/07/maurer-united-builds-indemann/. 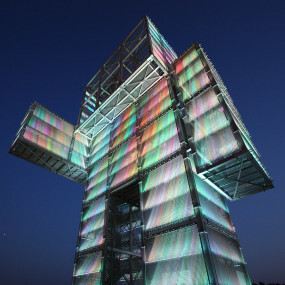 Indemann is a watchtower in Germany, designed by Maurer Architecten United. It has a LED media facade where neighborhood inhabitants can upload their own content in order to co-design the building. Maurer Architects distinguish between “sculptural architecture, which is used as a reference point in the organisation and branding of a city, and social architecture, which challenges users to engage in social interaction”. See also http://studio.driezesnul.nl/maurer/2009/09/indemann-_pics/. 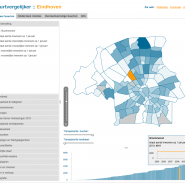 - Rotterdam Index – http://www.digitalepioniers.nl/projecten/Rotterdam-Index/93. Rotterdam Index (RIX) is an online neighborhood game. The idea is that participants get a virtual monetary budget to invest in Rotterdam neighborhoods. By playing, i.e. trading in stocks of specific neighborhoods , players implicitly give their opinion about these neighborhoods. The game registers the sentiments in the city with the aim to increase involvement of inhabitants with their city and in turn involve local governments with citizens. A project by Jeanne van Heeswijk, Dennis Kaspori, and Joost van Eeden. - Design for Emptiness – http://www.designforemptiness.nl. Many Dutch cities face the issue of empty shops and office buildings. In Heerlen this problem is even more urgent because of a shrinking population. Lively inner cities are vital as the entry card and visual identity of inhabitants. This project involved the challenge ‘Design for emptiness’, in which the winning idea received €10.000 to help realize it.